This image was taken on the HF Bar dude ranch located outside Buffalo, WY durring the morning wrangle of the horse herd. Taken with a Nikon D2H using a Nikon 70-200mm lens at 200mm. 1/640sec f/6.3. ISO 200 AF mode AF-C. Very few adjustments made in PS with a small crop of the bottom of the image. Very nicely done. The exposure looks "early in the morning", and the contrast of the light and dark subjects draw the eye into the scene. Now you have me wondering what this scene looks like in color. Leaving the brand in the right portion even adds thought. Yhanks for your comments. I would be more than happy to share the color version of the image. Beautiful! 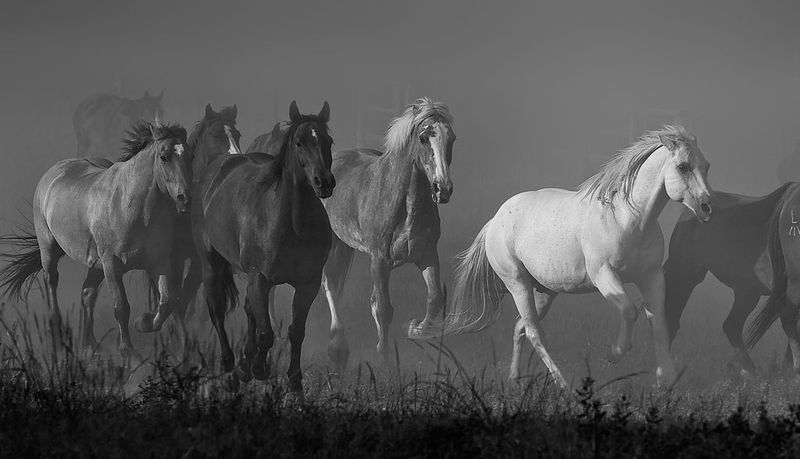 The contrasting coats of the horses really gives it a feeling of wild horses from the old west! Good job! I have a feeling you made the right choice in showing it in B&W. The contrasting values really enhance the energy in the image! ... it also emphasizes the soft light and dust in the air. Very nice composition! Excellent subject with excellent contrast that deeply enhances the motion within the image. A real eye catcher. Reminds me of the final scenes in the "Electric Horseman" starring Robert Redford when they released the horse and let him run free. Not only is it excellent composition it is a very moving composition.